Hotheads (パサラン, Pasaran) are items that, when thrown, will slide across the ground releasing bursts of sparks and damaging opponents of the thrower. When hit with attacks of the fire or electric effects, they grow bigger, dealing more damage and knockback. However, in contrast to what its Brawl trophy says, there is an upper limit to how large the Hothead can become (roughly three times its original diameter). A Hothead from Super Mario World. In Super Mario World, Hotheads were enemies that appeared inside Wendy Koopa's Castle in World 6, Chocolate Island. This level largely consisting of stone blocks, which had Hotheads constantly moving around them. Unlike those in Smash, they were not enlarged by fire and they never disappeared, though small and large versions of the enemy appeared together. A few Hotheads were also featured in Burt the Bashful's Fort and Baby Bowser's castle in Super Mario World 2: Yoshi's Island. Hotheads also appear in Super Princess Peach, first appearing in Shriek Mansion. In a Hothead's initial state, it is an item that can be picked up and thrown. It can also be attacked, and if it is attacked by fire or electric attacks, it will grow larger. 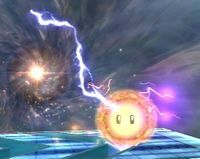 It activates when thrown, and once the Hothead lands on the ground or a platform, it will move along the surface in the direction it was thrown and periodically release sparks, which are almost twice as strong as a smash-thrown Hothead of the same size. While it is travelling, a Hothead can still be hit by attacks and grow larger. If it is thrown onto solid terrain, the Hothead will cling onto the surface, travelling along the walls or ceilings. However, if it is on soft terrain, the Hothead will fall off of the edge, and continue to fall until it lands again (or falls off the screen). Hotheads eventually disappear in an amount of time inversely proportionate to their size (that is, bigger ones vanish faster). A travelling or thrown Hothead can be reflected, which will change its ownership and reverse its direction of travel. A Hothead will reach maximum power after it takes approximately 30% damage. 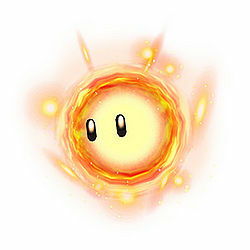 However, if the Hothead is undamaged and hit by a fire or electric-based attack that deals over 30% damage (such as Ike's Eruption), its power can exceed this limit and gain OHKO power. This can be taken to ludicrous extremes, such as knocking five Soccer Balls into a Hothead using Marth's Critical Hit (only in Training Mode is this plausible), causing the Hothead to deal 140% damage or more and become impossible to reflect. In Ultimate, Hotheads appear to change their direction when they travel offstage on flat surfaces instead of disappearing. They also can grow larger from any attack, and may even gain OHKO potential from strong enough attacks. Note: All of these damage percentages were taken with an uncharged Hothead. An item that, when tossed, sticks to the terrain and moves, causing damage to those it touches. Whoever threw it won't take damage. It will grow larger if it's attacked, which ups its attack range. However, an increase in size corresponds to a decrease in the time it stays on the screen. A really big Hothead will take up the entire screen, and is quite a sight to behold. Hothead trophy in Super Smash Bros. for Nintendo 3DS. Hothead trophy in Super Smash Bros. for Wii U. Once thrown, this guy will move across the ground and damage anything—except you—in its path. You can make the Hothead bigger by hitting it with attacks, much to your opponents' dismay. If you make it really big and powerful, it may just carry you to victory! Throw this on the ground and it'll slide around, damaging everything in its path, except you. You can make the Hothead get bigger and more powerful by attacking it with fire and lighting, and it's pretty impressive just how big and powerful it can get! Hothead is featured as a Spirit. In addition to the above, equipping the Plasma Wisp or Zip Support Spirits will give the player a Hothead at a start of a match. Oddly, even though Hotheads do fire damage, they cannot ignite Blast Boxes or idle Bob-ombs upon contact. In-game, Hotheads are actually a 2D texture. However, the Brawl trophy of the Hothead is a 3D model. Without the aid of items or customs, Roy can create the strongest Hothead out of any character by hitting it with a fully charged Flare Blade. The highest possible damage output known for a Hothead without hacking is 274% when smash thrown and 426% when it sparks. For a Hothead to become this strong, the situation with the five Soccer Balls and Marth's Critical Hit must be replicated, but after the Soccer Balls have sustained the maximum amount of damage. Hotheads will cling to and slide over the surface of some bosses. This page was last edited on April 2, 2019, at 13:25.